Truecaller is developed to finds contact details globally given name or telephone number and has an integrated caller ID service to achieve call-blocking functionality and social media integration to keep the phonebook up-to-date. And here how truecaller works and few things that you might not know about truecaller. Truecaller is an app that helps you finds contact details globally given a name or telephone number. Basically, Truecaller app acts as a phonebook which keeps the record of various contacts. It work's amazingly well in finding unknown callers as well as messengers. It shows whether the caller is spam or not. It also has an integrated caller ID service that enables call blocking functionality with social media implementation that to keep the phonebook up-to-date. Google play store contain Truecaller's android app for download. The working of truecaller is very simple we often call it crowdsourcing. Wheather it's google maps or it's truecaller its crowdsourcing that makes it possible for providing information to you. Actually, companies use their customer's data to help their customers. Yes, it is true. Truecaller uses your data to actually help you. Basically what happens that when someone installs the truecaller app, all contacts of that person got synced with truecaller's servers. Imagine, truecaller have million's of users so they eventually got millions of contacts all these are at truecaller's servers. And if you got a call from some unknown number who is not added to your contact list so there is a great probability that the number is might be added to some of the millions of truecaller user. Then truecaller search for that number on its servers and then it display's the name of that person. The name it shows might not be accurate. Because contact can be saved by any name. As many people save their contact by some nicknames, some use surname or some add city with their contact name like Rounit (Ajmer). So, if I call someone to whom I am unknown then truecaller show that name to the person. That's why it is not so accurate. But it gives some hint about the person who is calling you. Now if you think about your privacy, then there are so many people who have your number and some of them might be using the truecaller. What about your privacy? Here you can easily unlist your number from truecaller. If you don't want to let to know about your number to another person you can easily remove your number from truecaller. How to unlisted phone number from truecaller? If you don’t want your number listed in Truecaller you can easily remove it. Simply go here and enter your number that you’d like to remove. If you are a Truecaller user and have activated your number you need to Deactivate your account before visiting the unlisting page. Note that it requires up to 24 hours to actually remover the number. And if the number is marked as spam it cannot be unlisted. 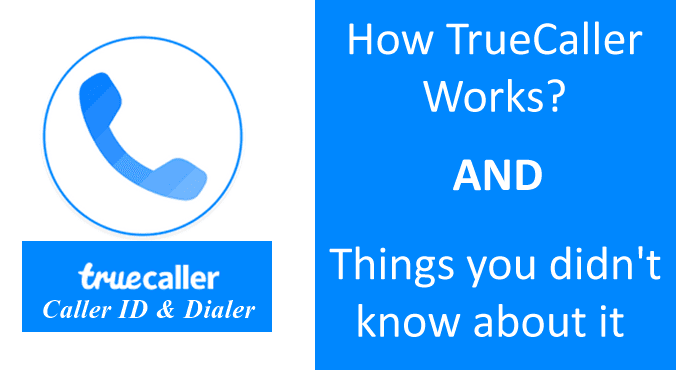 Here are things you might not have known that Truecaller can do. Truecaller can also work even when there is no internet on your device. Once the caller is identified by truecaller the caller can still be identified when there is no internet connection. Copy a number anywhere on your phone and truecaller will immediately identify it for you. You can even call or message the number quickly from there. Truecaller can block all the calls starting with the same number. Eg, if a call center has numbers starting with +91 8043, you can block all numbers of the type +91 8043 XXXXXX. Even if they use another number from their call center, they won’t be able to reach you.